I saved the best for last from the 2011 Nice Stems collection. This is I Lily Love You, a pink based jelly glitter with flakies! The flakies are mostly pink and semi-iridescent but it's still a flakie! To show you how it looks alone, this is 2 coats over OPI Natural Nail base coat. The flakies are hard to see on the nail, and there is also some glitter sprinkled out there too. Not sure how much I like this on my nails bare - it almost makes the fingers look injured? In the shade, it looks a bit better. I have to tell you, this dries gritty. You can use OPI Top Coat or RapiDry, but if you want a smooth finish, I recommend Seche Vite or nubar Diamont. Finally indoors with the flash, you can see the flakies, the glitter, the pink jelly base... it's all pretty. However, this color seriously looks amazing over other colors. 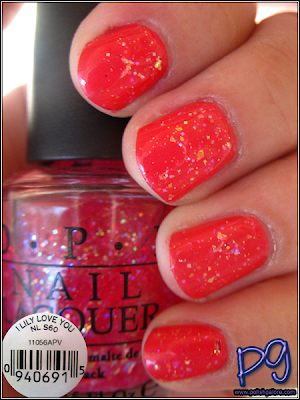 Here is it over OPI Come to Poppy. Oh yes, much better. I still wish the flakies showed up on the nail as well as it does in the bottle, but hey, it's a start! 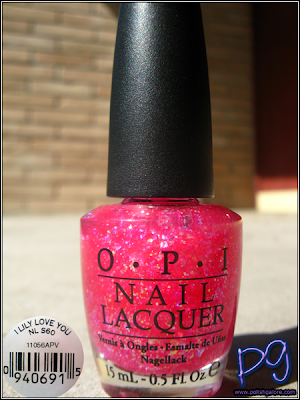 More like this OPI! And in the shade - seriously, I'm just repeating myself at this point. I LOVE THIS COLOR. I noticed that my salon I go to for my manicures and pedicures had this color up on the shelf, so it's good to see that the locals here like it too. I still have to say my peace on the piece that was in NAILS magazine but since I haven't gotten my issue yet, I'm waiting a bit. More on all that later. And this completes this collection! Woo hoo! OPI is available at Professional Salons, including Beauty Brands, Beauty First, Chatters, Dillard’s, JCPenney, Pure Beauty, Regis, Trade Secret, and Ulta, for $8.50 ($10.95 CAN) suggested retail for each Nail Lacquer. Please visit their website for details [official website]. I think i like the sparkles added onto of a brighter opaque color. but its cute for a summery sheer look. I love it as a layering polish! Looks super cute, and I do need more glitter and sparkles in my collection...! I like i lily love you, but I wish it wasn't as sheer. It's a great layering polish, but sometimes I just can't be bothered and I want it to look nice without having to mix polishes. argh why didn't i get this polish. i love it. it was the last one at the store..! but i chose teenage dream instead... which had many on the display. i couldn't get both.. boo. i thought i wouldn't like it.. arrrgh. arrrgh. I think I like this one better! This polish is so pretty! 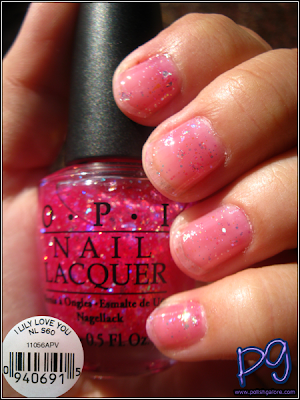 OPI Be A Dahlia Won't You?